So, in the past couple of days we've looked at the scientific evidence of some rather unexpected medical modalities, with their possibility of opening up new avenues for diagnosing and treating human disease. Today we're going to look at a more pressing issue, namely: did Martians build a city out of Legos in Antarctica? You may think I'm joking, but yesterday I ran across an article that claimed exactly that. I try not to spend much time in this blog writing about things that are simply ridiculous, but this one was so far off the deep end that I just had to. I kept thinking that it had to be a spoof, but once again, Poe's Law has bitten me on the posterior. Mike Perry, the author of "The Rainbow City Built by Martians in Antarctica," seems entirely serious. And where is this city? Somewhere hidden beneath the icy wastes of Antarctica. It's actually only one of network of Martian cities built over two and a half million years ago. 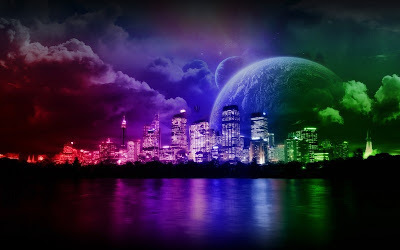 The other cities are now abandoned but Rainbow City remains inhabited by a few of the original colonists who made their way to Earth. Um, no. Thanks for asking. But please do continue. Millions of years back Mars was an okay place to live but their ancients realised that the planet was dying and it's oxygen and water was getting in shorter and shorter supply. It became a necessity to move, so they packed some of their bags and headed for Earth. At the time Antarctica was a good, warm place to live, but a great catastrophe of some sort occurred and the Earth was tipped on it's [sic] axis. The survivors of this disaster had to abandon all but the Rainbow City and tmany [sic] settled in the northern hemisphere and gradually lost there [sic] technological knowledge. Only Rainbow City remained - and remains to this day. Now, my question is, why on earth, other than having a mild mental illness, should anyone believe that this is true? The answer, Mr. Perry tells us, is the Hefferlin Manuscript, which tells us all about it. So what, other than "fiction," is the Hefferlin manuscript? It's a document that was written by William and Gladys Hefferlin of Sheridan, Wyoming in the 1940s, which alleged the colonization of Antarctica by Martians. A colony of Martians was still there, they said, and could travel all over the world via a network of tunnels, one of which conveniently ended in Sheridan. The Hefferlins had been in contact with a Martian named "Rani Khatani," and he'd given them the information in the manuscript. What's pretty clear is that the whole thing was a publicity stunt from the get-go. In 1946 the Hefferlins sent the manuscript in to the science fiction magazine Amazing Stories, which published it in October of that year. The readers were, by and large, outraged by what they saw as woo-woo nonsense infiltrating a magazine whose purpose was to publish good short fiction. One of them wrote in that he could only "heartily suggest that Mr. Hefferlin buy a good book on radio and electricity and learn a little about the subject before he writes any more articles... I honestly cannot see how anyone with a high school education could read Mr. Hefferlin's article without laughing." Fascinating post and well, who can say for sure, right? The Easter Islanders (when you can get them to stop telling you what you want to hear) claim to have come from Antarctica, before the cold. They say it's the source of 'The Mana" that was used to move the moai. From the book, "Mysteries of Easter Island" by Francis Maziere. All of which makes me want to sob softly while pounding my forehead on the desk. Anyhow, that's it for today. I don't know what else I could possible add, here, other than to mention that according to Mike Perry and others who buy the Hefferlin manuscript as gospel, the Hefferlins themselves were taken to "Rainbow City" when they got old and have been rejuvenated and are living there still as "wise immortals." Which sounds nice enough, until you realize that this means they have to spend eternity in freakin' Antarctica. I mean, I think upstate New York is cold enough.